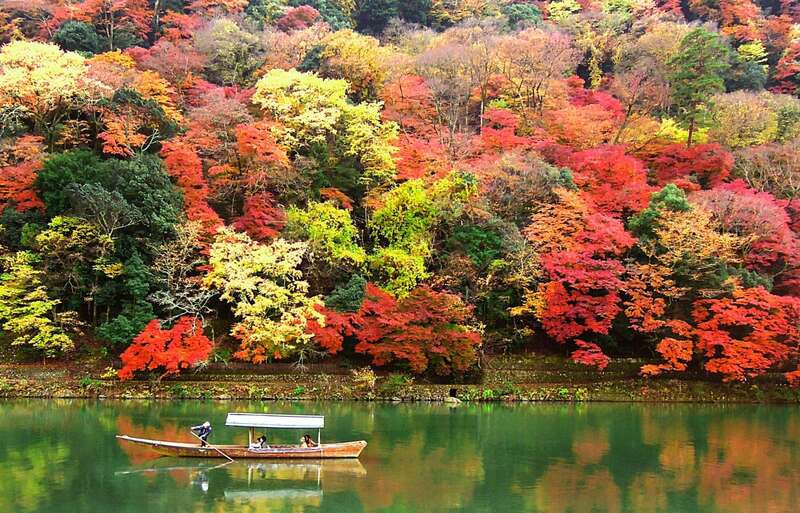 All About's travel guide Takao Morikawa reveals 15 of the best places in Kyoto to enjoy autumn colors. Known as Eikando of Autumn Leaves, Eikando Zenrinji is a great place to go to enjoy autumn foliage. Trees dressed in crimsons and deep oranges hide the temple in a veil so vibrant it could be on fire. The reflection of autumn leaves on the shiny black lacquer floor possesses mysterious beauty that cannot be experienced anywhere else. The reflections can be best appreciated on a clear, sunny day. Tenjuan is a commemorative temple for the founder of Nanzen-ji, known for its illuminated autumn leaves. Located adjacent to Nanzen-ji, the illuminated trees viewed from inside the temple resemble a framed painting. Tofuku-ji Temple is famous for the Tsutenkyo Bridge that spans the Sengyokukan Valley. 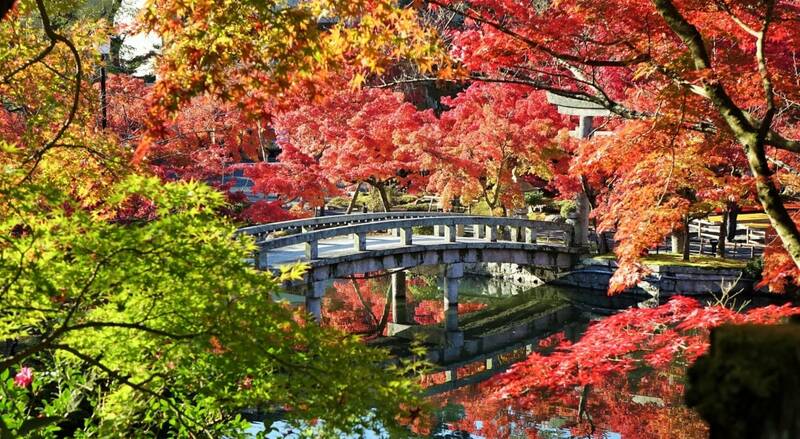 The view of the Tsutenkyo Bridge enshrouded in fall foliage is one of the best-known autumnal views in Japan. Situated on the side of Mount Ogura, Jokakko-ji Temple has been a famous autumn color spot for centuries. This is where Fujiwara no Teika compiled the Ogura Hyakunin Isshu, an 13th-century anthology of 100 classical poems by 100 poets. The temple is magnificent in late autumn as a gradation of colors, from green to yellow and crimson, gleams in the sunlight. Hogon-in is a is a commemorative temple for the Tenryu-ji Temple in Arashiyama. The beauty of the nocturnally illuminated Shishiku Garden ("Garden of the Barking Lion") is sure to leave you speechless. If you want to enjoy autumn colors in the midst of gorgeous nature, head out to the Takao area on the outskirts of Kyoto. Be sure to check out Jingo-ji Temple for illuminated autumn leaves at night. Sanzenin Temple in Ohara is the most famous fall color spot in the Rakuhoku area, located deep in the northeastern part of Kyoto. The beauty of red and yellow leaves scattered around the moss garden and colorful trees reaching for the sky makes you sigh in wonder. Arashiyama is a well-known sightseeing spot in Kyoto that offers various ways to enjoy autumn leaves, from the usual temples to riverboat rides and scenic trolley trains. It may be worth staying overnight at one of Arashiyama's traditional hotels to experience the pretty fall gardens and scenery before the crowds arrive. Located in the northern reaches of Kyoto proper, the beauty of Kibune Shrine in the autumn will take your breath away. Various live events are also held during the nocturnal illumination season. The cable car up from the Kurama side is half the fun! Toyotomi Hideyoshi was one of the three great warlords who unified Japan in the late 16th century. After viewing the cherry blossoms of Daigo-ji Temple one spring, it's said he already began to prepare to return for the season of autumn leaves, but he died in the summer of the same year. The autumn leaves of Daigo-ji Temple are now known as those that Toyotomi Hideoyoshi was only able to see in a dream. Remnants of the Odoi, an earthen mountain of fortifications built by Toyotomi Hideyoshi encircling Kyoto, remain in the Momiji-en Garden, where around 250 maple trees spread out wearing their autumn colors. With its refined architecture, Shorenin Temple is one of the five Monzeki temples of Kyoto's Tendai Buddhist sect. The artistic illumination here is different from other temples in this style, with visitors free to stroll around the illuminated garden paths. Located in the city of Nagaokakyo, Kyomyo-ji Temple is known as the Temple of Maples. Hundreds of maple trees grow on the temple grounds, some of them over 100 years old. The Maple Path often seen in commercials is the most popular view, with the fallen crimson leaves making a beautiful scene. Although all of Kyoto gets crowded during the fall foliage season, this is especially the case with the popular tourist attraction of Kiyomizu-dera Temple, so please be prepared. The massive wooden veranda of Kiyomizu-dera surrounded by autumn leaves is like something straight out of a picture book. All About's domestic travel guide.